The AMD FirePro M8900 is a high-end graphics card for mobile workstations. It is based on the same chip as the Radeon HD 6970M (Blackcomb XT) and therefore offers UVD3 decoding and slightly improved Tessellation performance compared to cards found in the previous generation (e.g., Radeon 6800 series). Compared to the Radeon consumer line, the FirePro offers certified drivers for professional 3D applications. Due to optimizations and some unlocked features, the performance when running professional applications is highly improved. The 960 Stream processors should be still based on the "old" 5D architecture, similar to the 5000 series. Due to the different architecture of the FirePro M8900, however, the core count cannot be directly compared to the 1D cores of current Nvidia GPUs. The Stream processors can be used with DirectX 11, OpenGL 4.1, DirectCompute 11 and OpenCL. With the later two, the cores can also be used for general computations like transcoding videos. The theoretical performance of the FirePro M8900 is similar to the consumer counterpart, the Radeon HD 6970M. However, due to the specialized professional drivers, games may run a bit slower. The 6970M is able to run modern games in high settings and resolutions fluently (see benchmarks on the HD 6970M page). Furthermore, the FirePro M8900 integrates a HD audio controller to transmit HD Audio (TrueHD or DTS Master Audio) over HDMI or DisplayPort (e.g., for Blu-Ray videos). The AMD HD3D Technology offers support for Blu-Ray 3D and 3D displays (integrated and external). However, the solution is not as mature as Nvidia's 3D Vision. Thanks to Eyefinity, the M8900 graphics chip is able to theoretically drive up to 5 monitors simultaneously. However, this only works if the laptop features enough DisplayPort outputs. The power consumption of the chip should be similar to the HD 6970M and is therefore best suited for large laptops (17-inch or greater) with good cooling solutions. 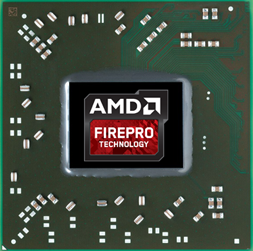 The AMD FirePro M6100 is an high-end graphics card for mobile workstations, which has been presented in mid-2013. Similar to the Nvidia Quadro series, the FirePro cards offer certified drivers for professional 3D-software like CAD. Due to optimizations and some unlocked features, the performance in these applications is much better compared to a consumer Radeon GPU. The FirePro M6100 integrates 14 Compute Units based on the GCN architecture. Therefore, the chip has 768 stream processors. The memory of up to 2 GB GDDR5 is connected via an 128-bit interface. Just like the Radeon series, the FirePro M6100 offers features like Eyefinity, Enduro or PCIe 3.0. Presumably, AMD uses a partially deactivated Bonaire graphics chip, but this has not yet been officially confirmed. Thanks to the very high clock rate of up to 1100 MHz for the chip and 1500 MHz for the memory (6000 MHz effective, 96 GB/s), the 3D gaming performance is somewhat above the Nvidia Quadro K4100M or GeForce GTX 860M. Recent Games of 2014/2015 can thus be played fluently in medium to high details and full HD resolution. The FirePro M6100 features different energy saving techniques to reduce power consumption and prolong battery life. These include PowerPlay and PowerTune (for clocking the GPU), Zero Core (deactivates parts of the GPU when the display is off) and Enduro (dynamic GPU switching between the processor graphics and the dedicated Radeon GPU). However, the Fire Pro M6100 should still have a relatively high TDP (probably about 75 watts) and is only suited for large and well-cooled workstation notebooks from 15 to 17 inches. The AMD FirePro M5100 is a middle-class graphics card for mobile workstations, which has been presented in mid-2013. Similar to the Nvidia Quadro series, the FirePro cards offer certified drivers for professional 3D-software like CAD. Due to optimizations and some unlocked features, the performance in these applications is much better compared to a consumer Radeon GPU. Except for the certified drivers, the M5100 is more or less identical to the Radeon HD 8870M. The FirePro M5100 integrates 10 Compute Units based on the GCN architecture. Overall, the chip has 640 stream processors, 40 TMUs and 16 ROPs. The memory of up to 2 GB GDDR5 is connected via an 128-bit interface. Just like the Radeon series, the FirePro M5100 offers features like Eyefinity, Enduro or PCIe 3.0. Presumably, AMD uses the Cape Verde graphics chip, but this has not yet been officially confirmed. According to the clock rates of up to 775 MHz for the chip and 1125 MHz for the memory (4500 MHz effective, 72 GB/s), the 3D gaming performance will be slightly above the Nvidia Quadro K2100M or GeForce GT 750M with GDDR5 memory. Recent Games of 2014/2015 can thus be played fluently in medium to high details and a resolution of 1366 x 768 pixels. The FirePro M5100 features different energy saving techniques to reduce power consumption and prolong battery life. These include PowerPlay and PowerTune (for clocking the GPU), Zero Core (deactivates parts of the GPU when the display is off) and Enduro (dynamic GPU switching between the processor graphics and the dedicated Radeon GPU). The maximum power consumption under full load should be about 50 watts (estimate), making the card suitable for laptops 15 inches in size or greater.